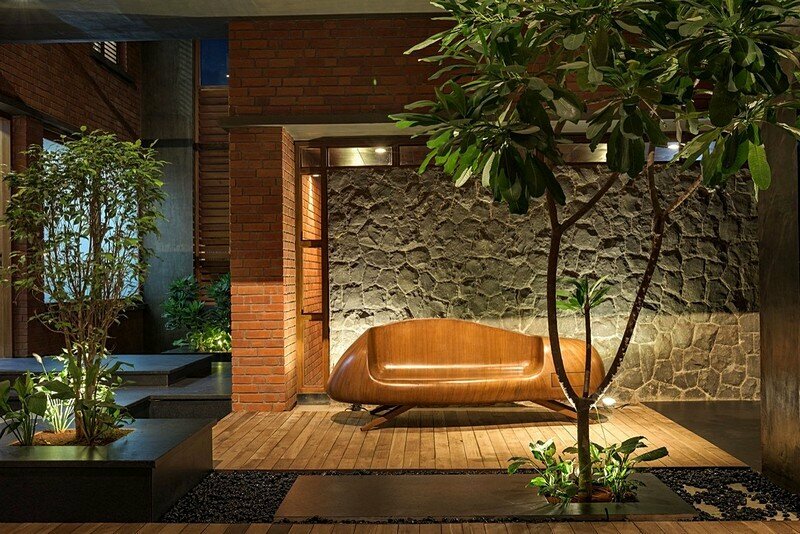 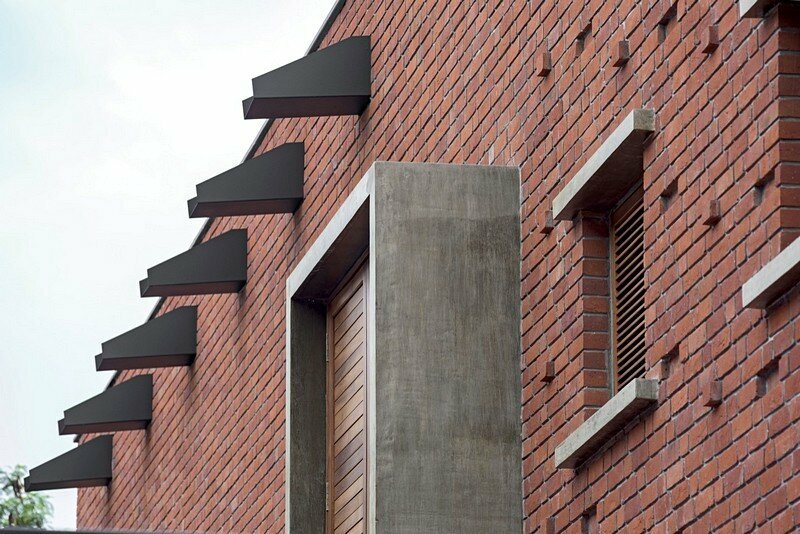 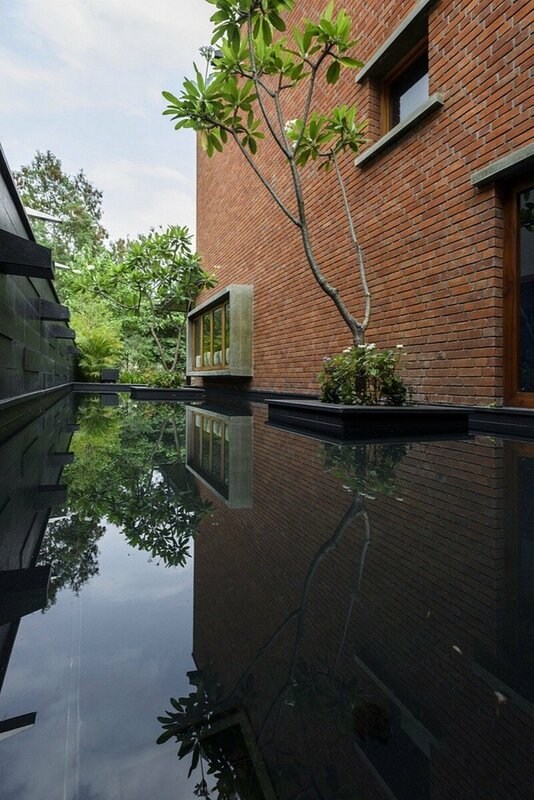 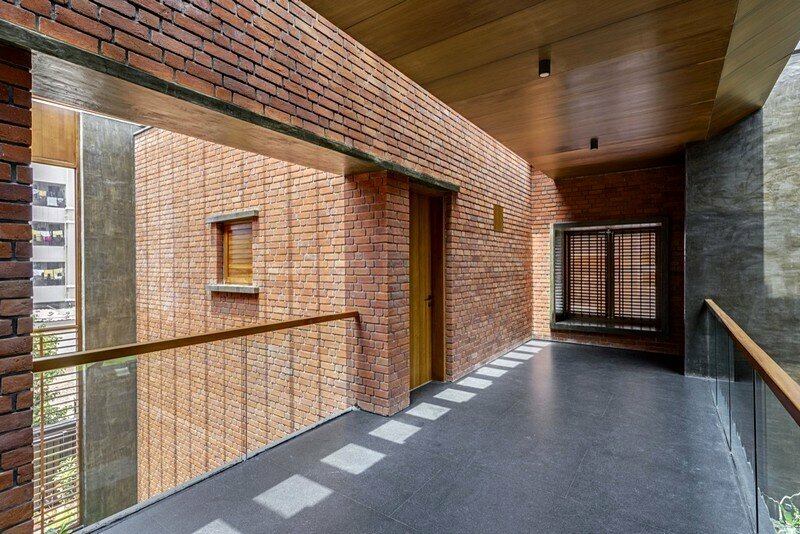 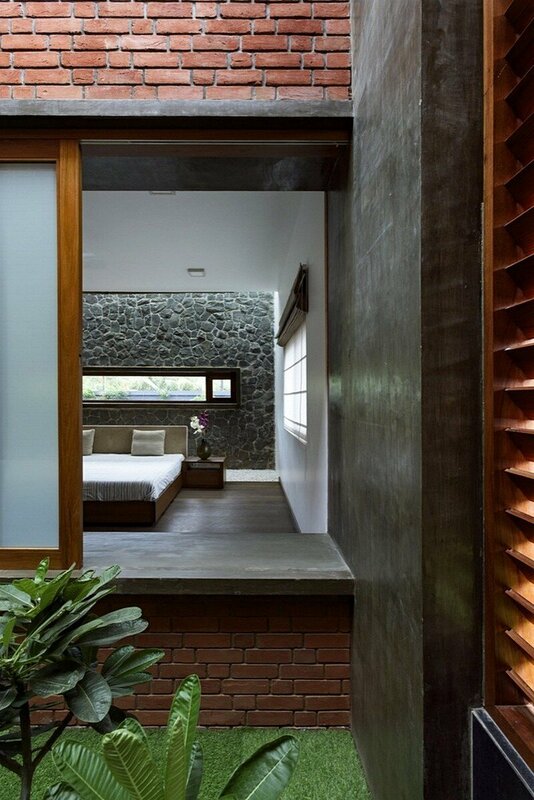 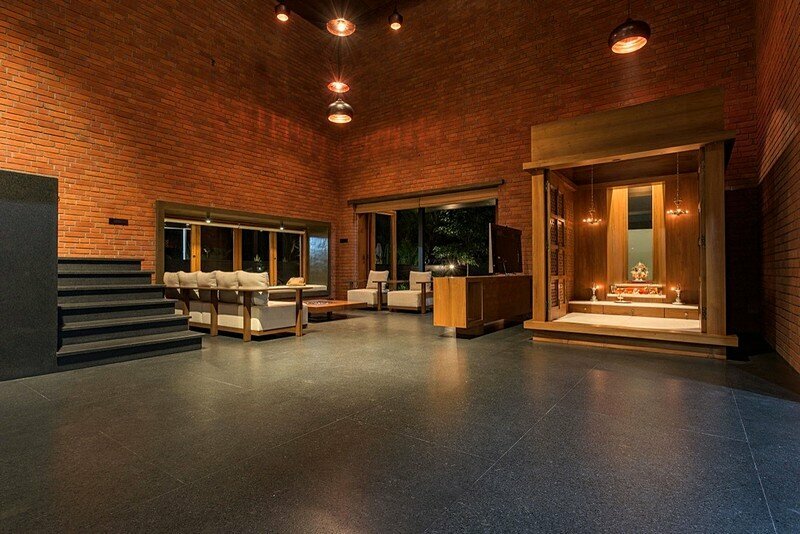 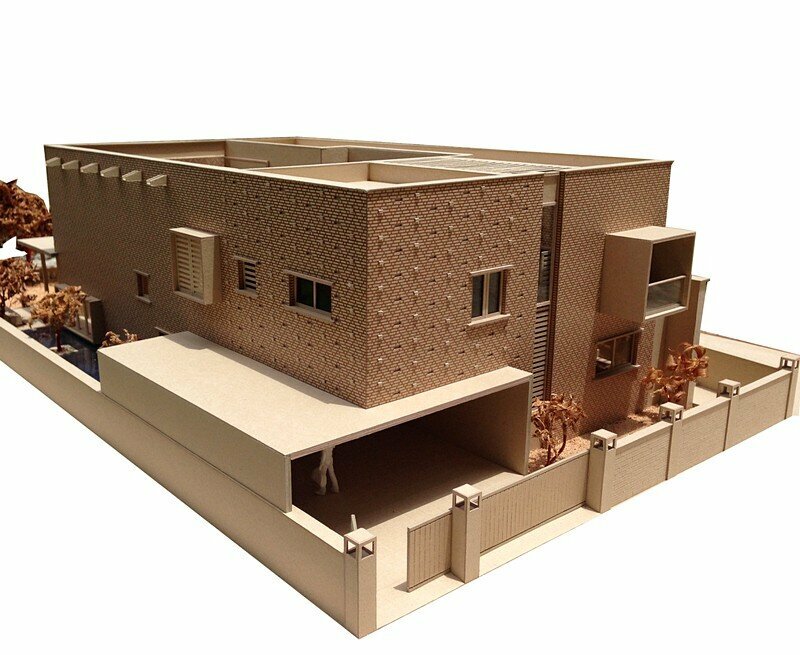 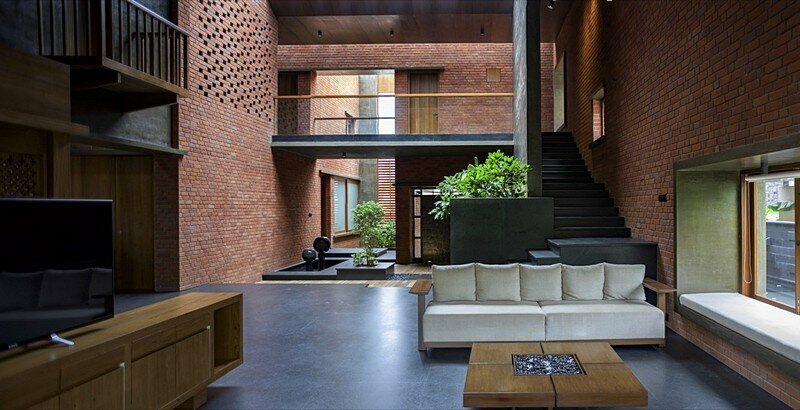 Project description: The brick house occupies a land parcel of 800 sq. 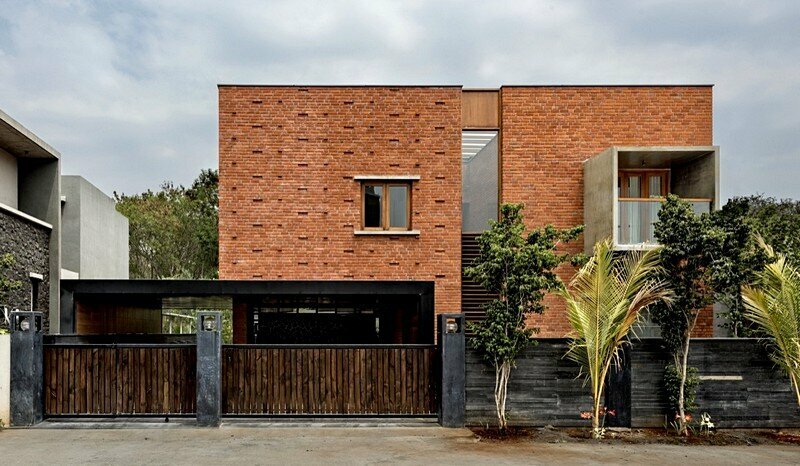 on the suburban edge of Pune – with a reserve forest on the rear and a dense urban housing on the access road to the front. 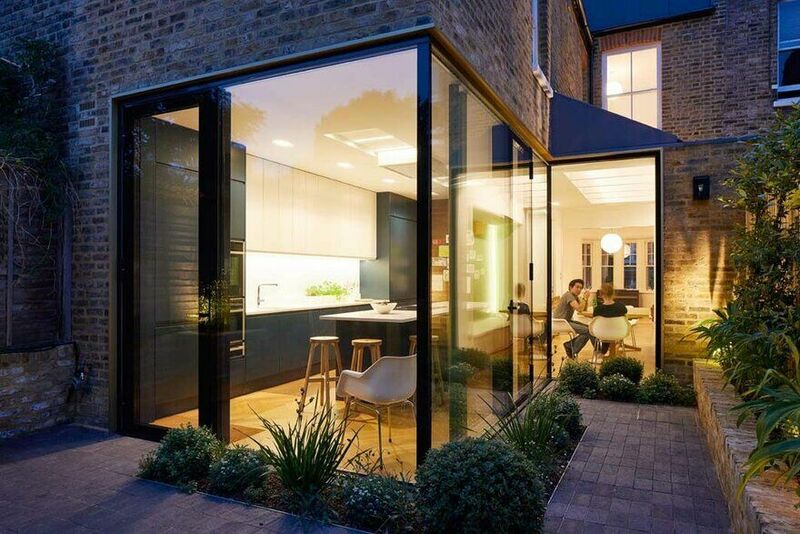 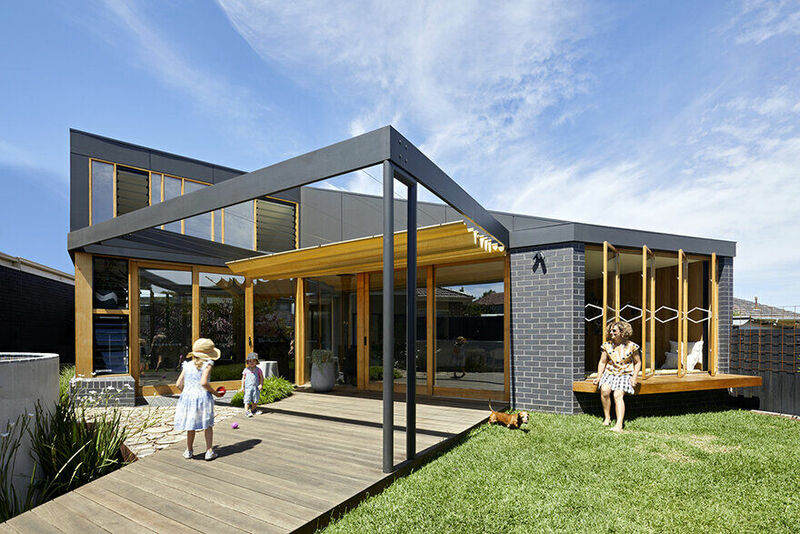 So, the site creates an interesting opportunity to flip a typical suburban house condition and open up the major public areas to the backyard garden looking towards the forest beyond. 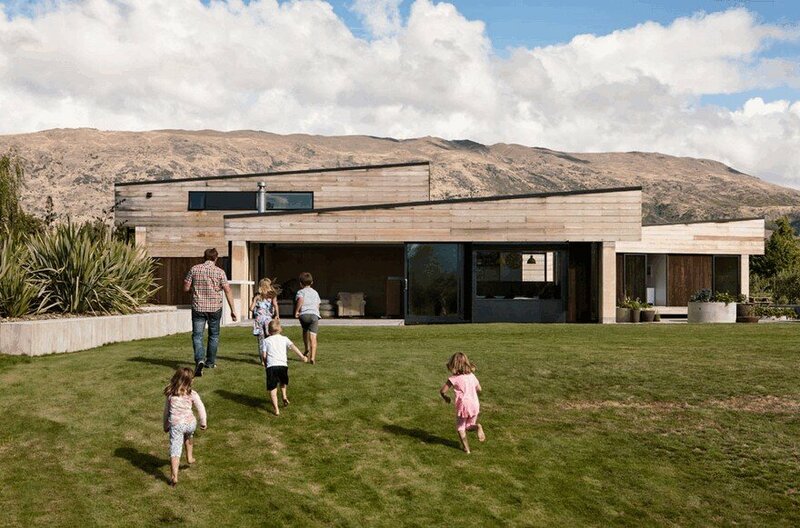 Instead of the mundane suburban street the strategy here is to evoke a feeling of living in a hinterland. 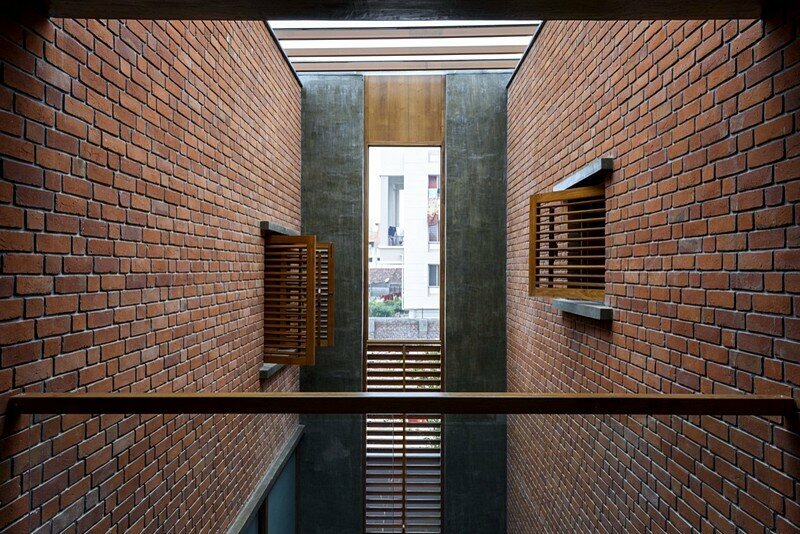 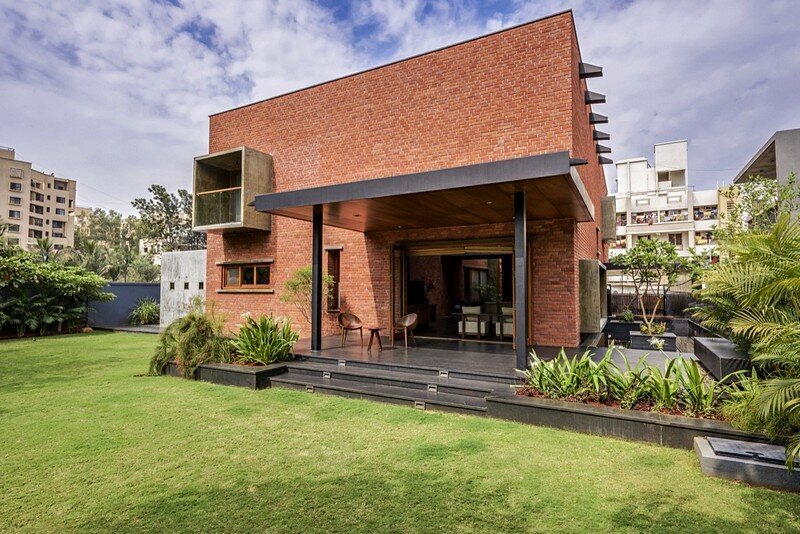 The house is conceived as an introvert form with a solid mass of brick which stands still and bold from outside. 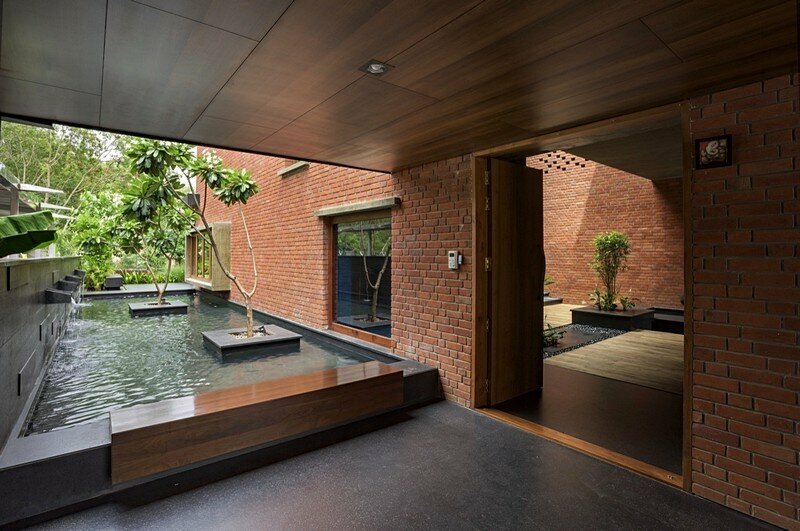 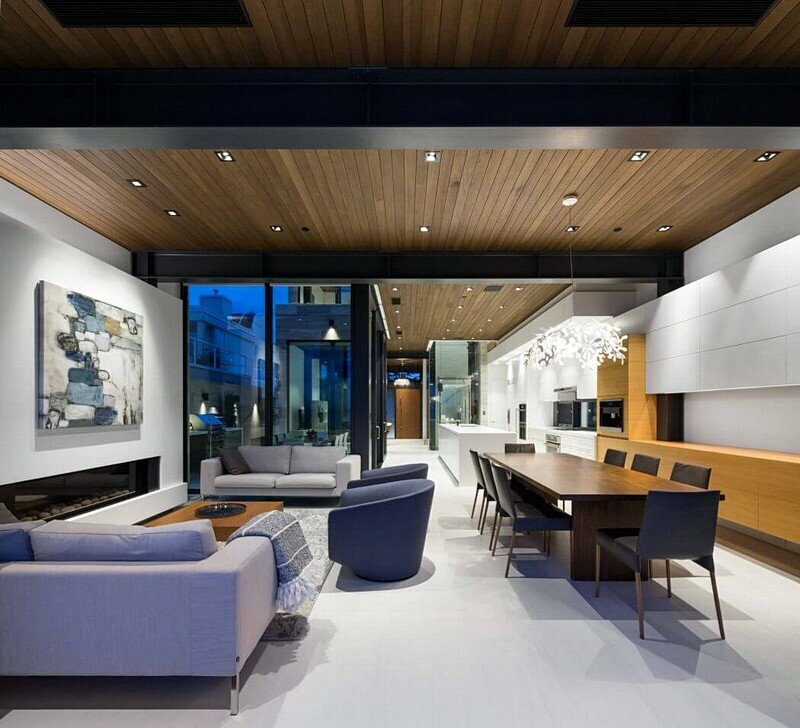 The dynamic play of light and volumes is revealed only when one enters and walks through different spaces inside. 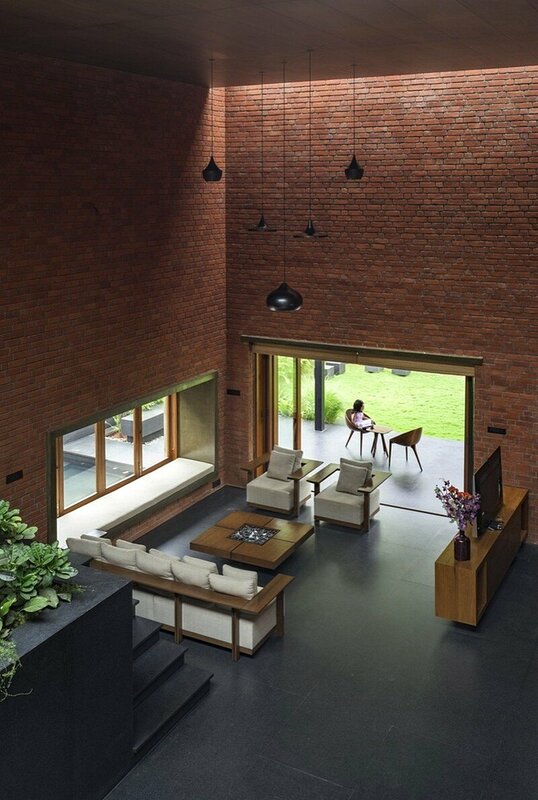 The living with its large volume is designed as a public node surrounded by built spaces which opens up to the backyard verandah allowing a seamless view of the lawn and forest beyond. 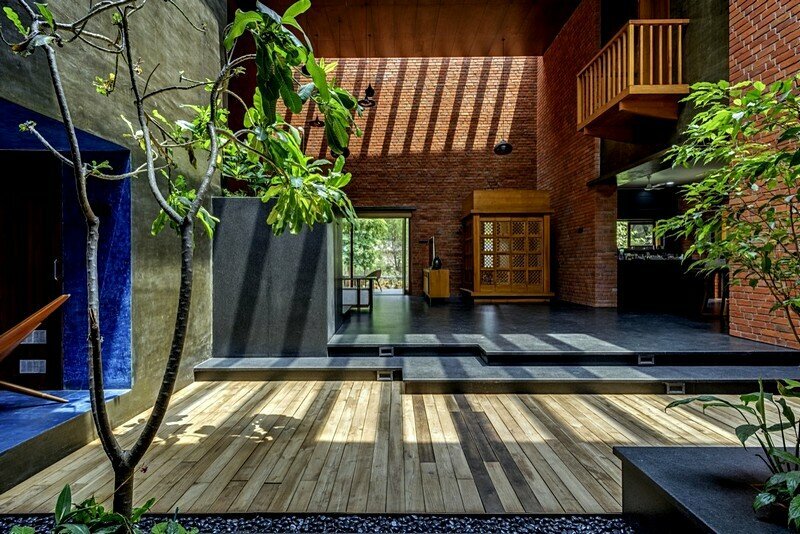 The east-west orientation of the living space welcomes the warm morning sun and some migrating birds and peacocks from the forest occasionally. 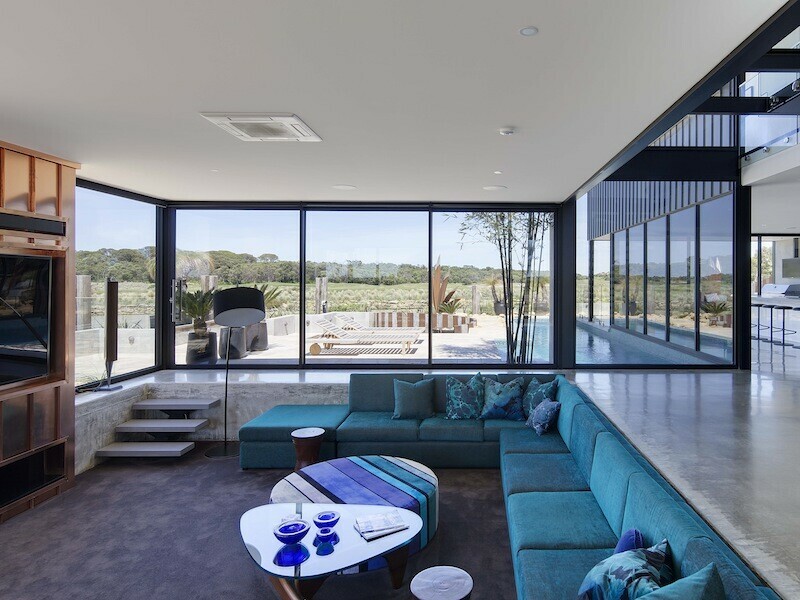 The cooking, dining and sleeping areas are aligned to the south and west of the site to protect the living areas from direct heat. 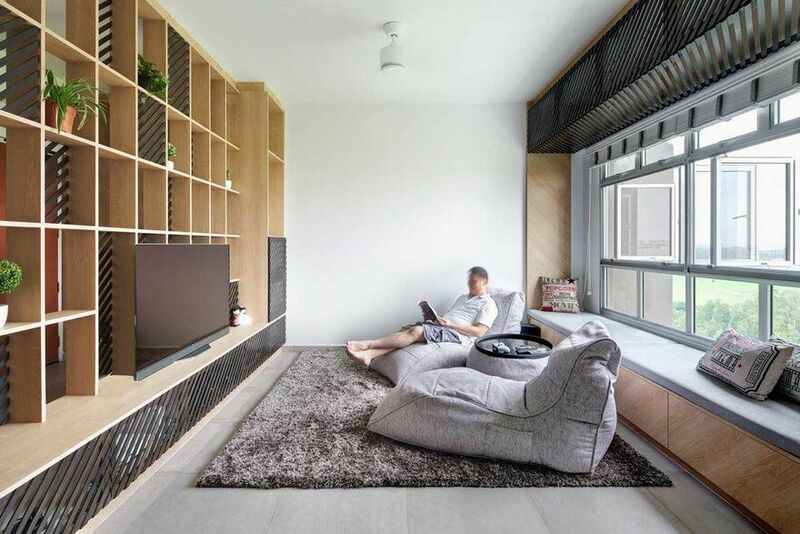 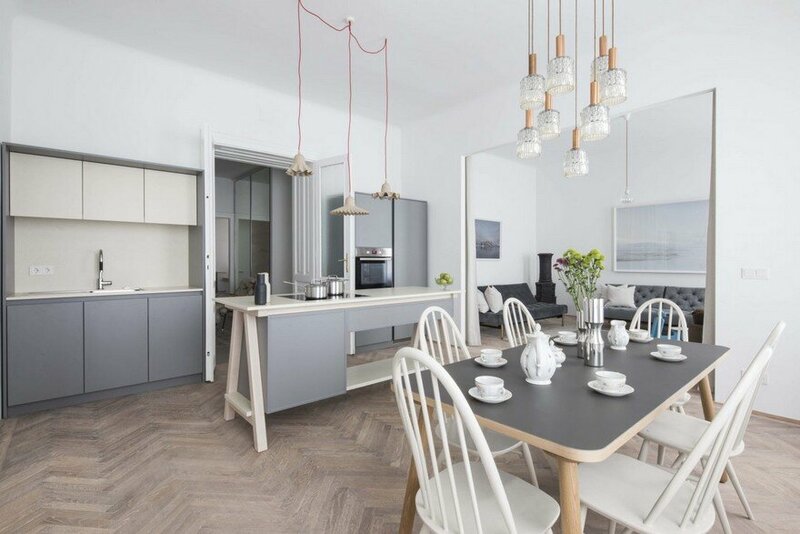 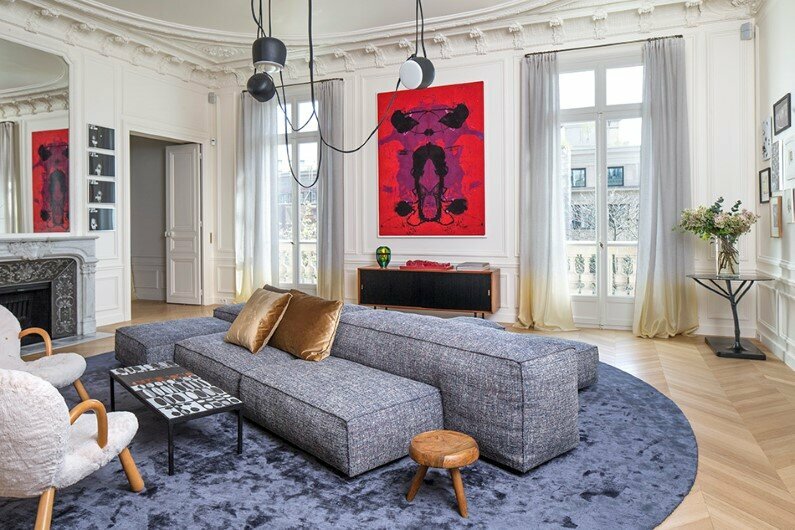 Each bedroom is designed considering the intuitive usage of space with inbuilt seating and furniture to go beyond the normative idea of formal living spaces. 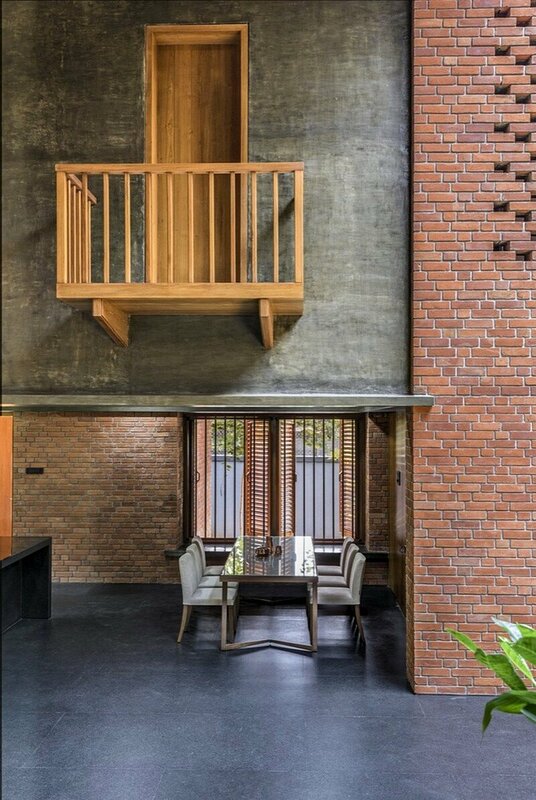 Each bedroom has got three different types of windows, one for seating -to enjoy interior courts, another small window for cross ventilation and the third is a balcony to go out and enjoy the distant landscapes. 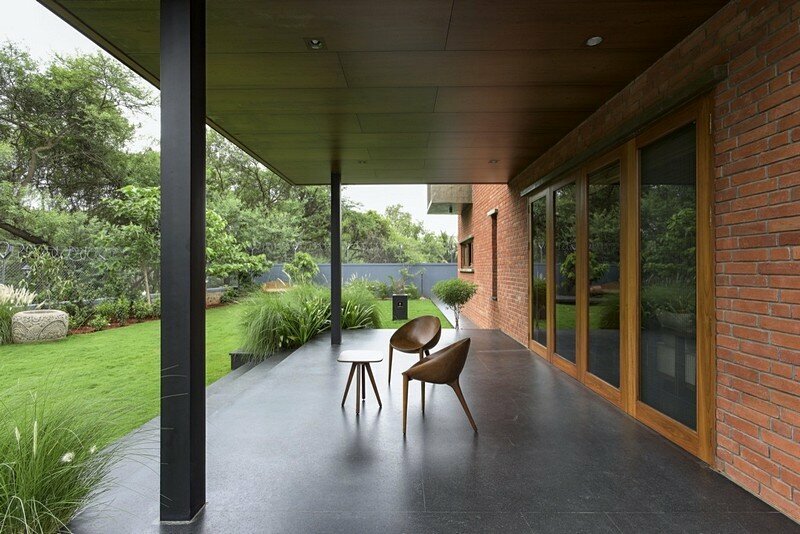 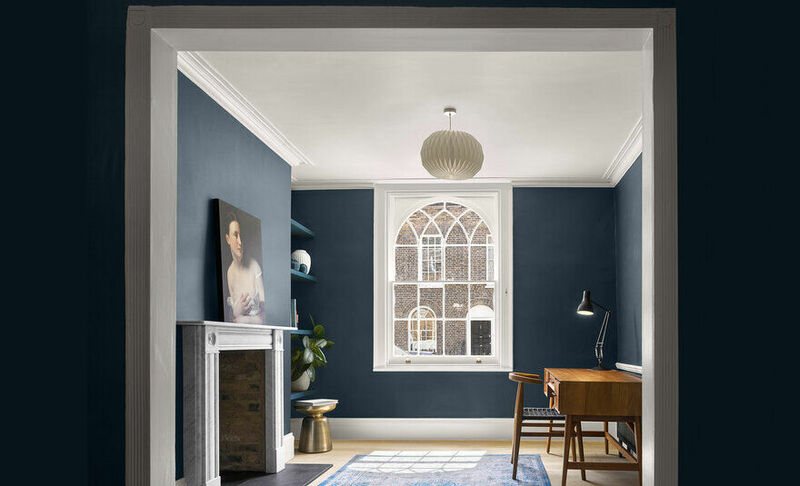 The space is composed of all natural and earthy materials like the Black Granite floor – a reference to the monolithic basalt plinth of typical historic temples and forts in the region. 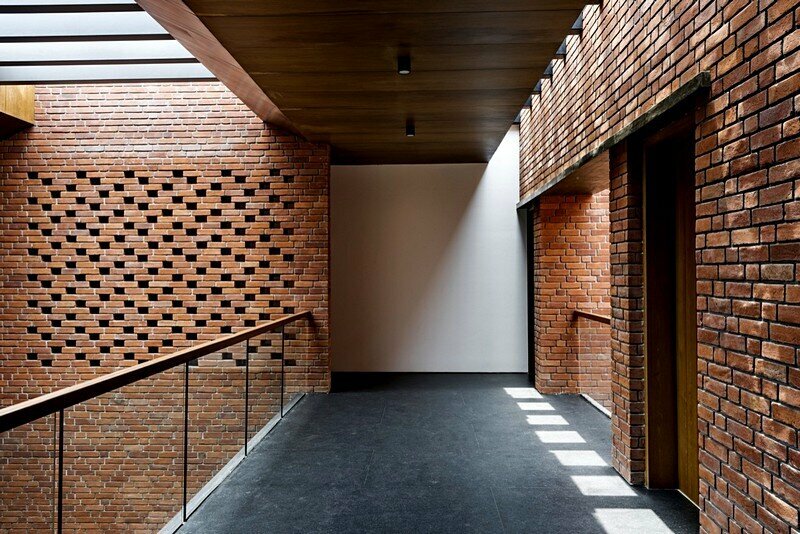 The exposed brick walls constructed using Racking Monk bond – resembles the traditional Indian weaving patterns and adds a different value to the most conventional material like brick, the wood veneered ceiling which floats above the public areas with pergolas at the edges and the center of it, creating an ever changing pattern of light throughout the day, making it a unique experience to be in the space at different times of the day and finally, the grey-green cement box windows with operable louvered teak windows frame the views of the surrounding garden and distant forest. 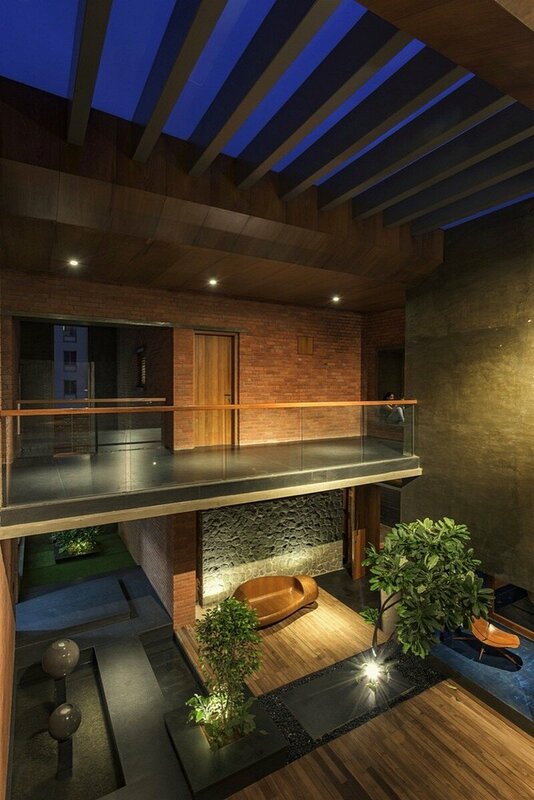 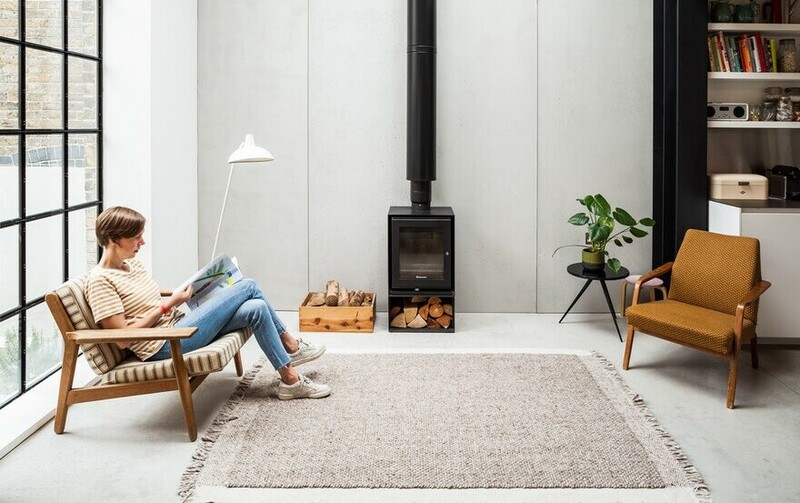 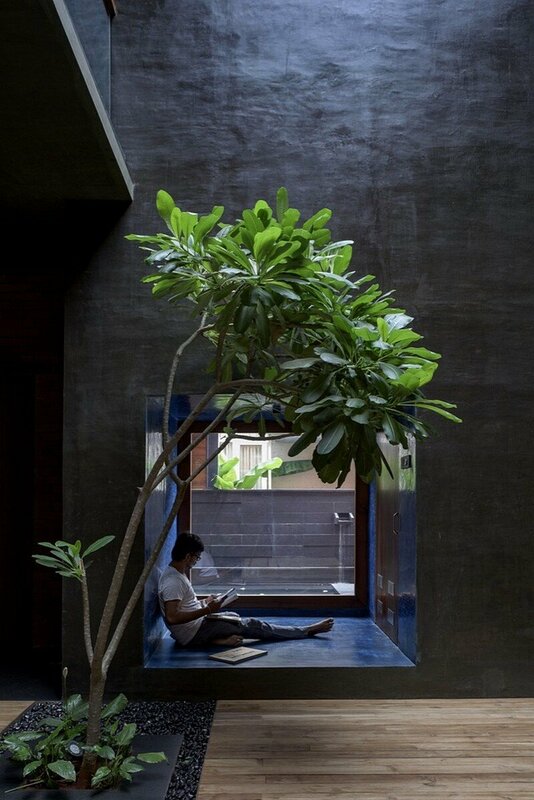 This house is an attempt to create a level of privacy within the urban environment, where the users could interact with each other and nature as playfully as possible. 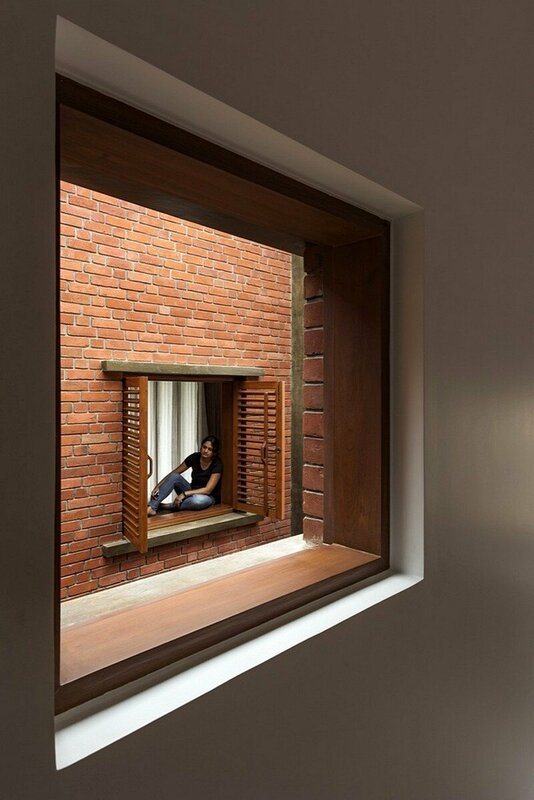 Keeping all the formal layers of life aside and take a pause from the busy life of the city.